Last Sunday, the Boston Breakers secured their first win of the season against Sky Blue at Harvard Stadium. 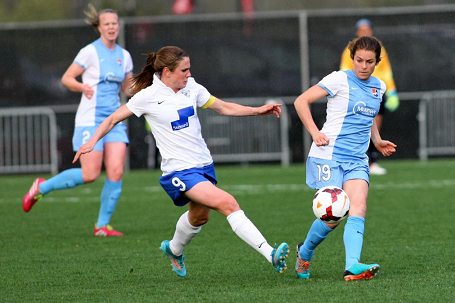 Six days later, Sky Blue returned the favor at Yurcak Field. On the back of a 14th minute Monica Ocampo goal, Sky Blue grabbed their first win of the season in a 1-0 victory on their home turf. Lisa DeVanna’s 89th minute red card forced the Breakers to finish the match shorthanded. With the loss, the Breakers dropped to 1-3-0 (3 points) while Sky Blue upped their mark to 1-2-2 (5 points). Though the Breakers couldn’t find their way to the scoreboard, it certainly wasn’t for lack of effort. Inside of three minutes, Heather O’Reilly hit a shot on frame that Brittany Cameron was called upon to push over the bar. Despite the early pressure from their guests, the New Jersey selection secured a goal in the 14th minute when Kelly O’Hara crossed it from the left into the area, where Ocampo powered it past keeper Alyssa Naeher to grab the lead. Mollie Pathman and reigning NWSL Player of the Week Lianne Sanderson each tested Cameron as the first half progressed, but the Sky Blue keeper was up to the challenge each time. O’Reilly was afforded another crack at beating Cameron in the 49th minute after firing a shot that was initially saved. But even though the Breakers’ forward collected the rebound, the Sky Blue keeper was up to the test again to deny O’Reilly. The remainder of the second half saw both teams attempt to test the opposing keeper, but it was all for naught, as Sky Blue held on to secure the win. The Breakers return to action on May 15 when they host the Chicago Stars at Harvard Stadium. Kickoff is set for 7pm.